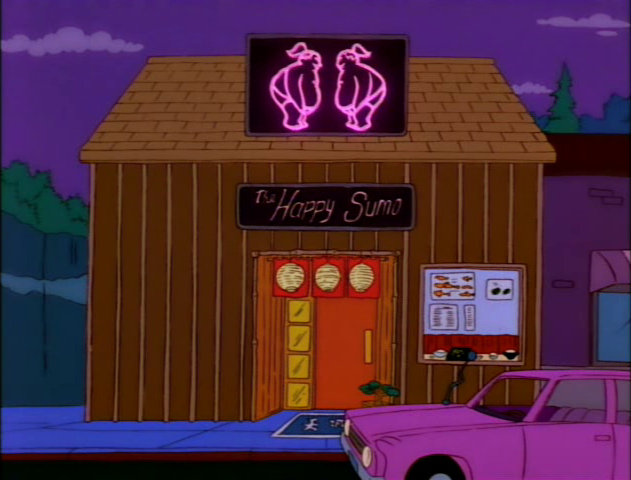 The Happy Sumo is a Japanese restaurant located on Elm Street. Among the restaurant's menu offerings are all kinds of sushi, including fugu, which can be fatally poisonous if not properly prepared. The Master Sushi Chef is the only person at the restaurant qualified to prepare fugu. The restaurant also offers karaoke. When Homer ordered fugu while the Master Chef was away from the kitchen, Toshiro was left to prepare the fugu on his own, and was very fortunate not to have killed Homer. The restaurant prints a map to the hospital on the backs of its menus, to be prepared in the event of a possible poisoning, such as Homer's. 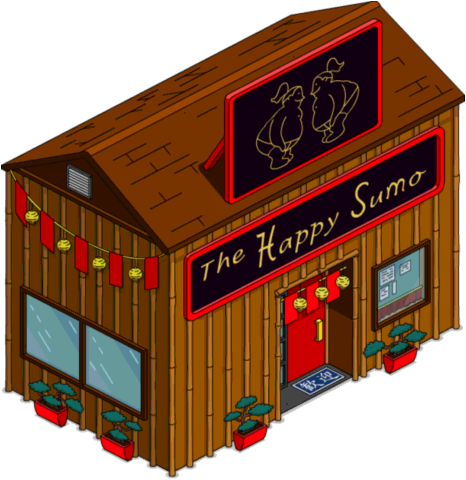 The Simpsons ate at The Happy Sumo not long after it opens when Lisa convinces everyone to try the new restaurant (and convinces Homer to try sushi). They also eat there when Sideshow Bob is released from prison and takes Selma (with whom he was corresponding while still incarcerated) and the family out to dinner. Merchandise – "The Simpsons Monopoly"
↑ 1.0 1.1 "One Fish, Two Fish, Blowfish, Blue Fish"
Modified on April 19, 2017, at 09:13.